They have graced the front cover of the Wall Street Journal, aired on BBC television, and featured on many other international media networks including Fox News, Today Australia, ABC News, and most recently, widespread attention throughout Mainland China. 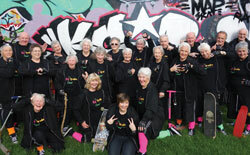 Hip Op-eration Crew originally started as a flash mob in August 2012 who performed randomly throughout Auckland. In January 2013, the group officially became a hip hop group and is currently a 23-strong group ranging between 67 and 95 years of age. All of the group live on Waiheke Island, a small tranquil island, near Auckland, off the East coast of New Zealand. The group’s manager, Billie Jordon, says their motto is simply RHY — Respect and Honour Youth. The group donates 10 percent of its funds to the Otara Youth Programme to help support the Dziah Dance Academy. They have become an internet sensation after performing at the World Hip Hop Championship Finals in Las Vegas as well as successfully competing at the National Hip Hop Championships in Auckland for the past two years. Their performances are synonymous with standing ovations. While their hip hop dance routines are rather demanding both physically and mentally, many of the crew have significant health or mobility issues. Four use mobility aids, many are deaf, some have dementia and one is legally blind. 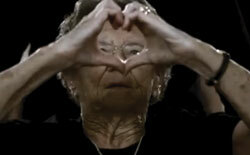 The average age is 80-years-old. “Even though their age limits their dancing capabilities, they are really inspired by the founders of hip hop from the Bronx who believed it’s not about limitations, it’s about possibilities,” says Billie. The Hip Op-eration crew have proven that regardless of age or a lack of physical ability, they are not letting any limitations stand in the way of staying active and hip hopping. “They are really driven to prove themselves as performers and show senior citizens really can do anything,” says Billie. One of the aims of the group is to address the misconceptions and prejudices that people have about elderly people, whilst also forging a stronger connection with youth. The makers of Hip Hop-eration are eternally grateful to the entire Hip Op-eration crew for their patience, understanding and cooperation in making this inspiring film. We remain in awe at their passion and determination to live the life they dream of. Please show your support.